Shri Singha (Skt. Śrī Siṃha; Tib. ཤྲཱི་སིང་ཧ་, ཤྲཱི་སིངྷ་, དཔལ་གྱི་སེང་གེ་, Wyl. dpal gyi seng ge) — one of the early masters of the Dzogchen lineage, who was originally from the kingdom of Khotan located in the present day Xinjiang province of China. He was a disciple of Mañjushrimitra and the main teacher of Jñanasutra. 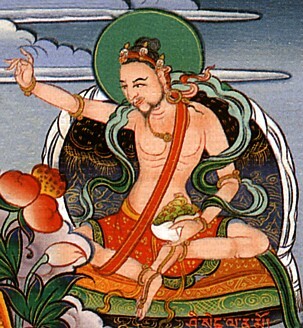 He is famous for arranging the teachings of the Pith Instruction Class (mengak dé) into four cycles: outer, inner, secret and innermost secret unsurpassed. His last testament, which he conferred upon Jñanasutra before passing into the rainbow body, is called the Seven Nails. Dudjom Rinpoche, The Nyingma School of Tibetan Buddhism, Its Fundamentals and History, trans. and ed. Gyurme Dorje (Boston: Wisdom, 1991), book one, pages 497-501. Nyoshul Khenpo, A Marvelous Garland of Rare Gems: Biographies of Masters of Awareness in the Dzogchen Lineage (Junction City: Padma Publications, 2005), pages 39-40. Tulku Thondup, Masters of Meditation and Miracles, edited by Harold Talbott (Boston: Shambhala, 1996), pages 62-64. This page was last edited on 16 July 2015, at 08:52.